Classic fat "Doubled Up" single coil tones - Great clarity and string definition with a bright chime & warmth. Individual threaded pole magnets charged to around 2/3rds capacity allow you to dial in each string. A warmer mid-range than standard single coils and with a higher output, they're great for breaking up an amp. With a great fat bridge tone sounding akin to a "doubled-up" Tele and a neck with a warm, sweet brightness, these Wide Range / Thinline Humbucker style pickups are a great if you're looking for something more to replace a standard P90 Dogear. Slightly brighter with a tighter focus that my full-size Classic '71 Wide Range / Thinline Humbucker repros due to the slightly narrower coil and slightly lower output. Available with either Vintage Braided or 4-Way wiring, the cover options are black or cream covers and I can also age them a little. 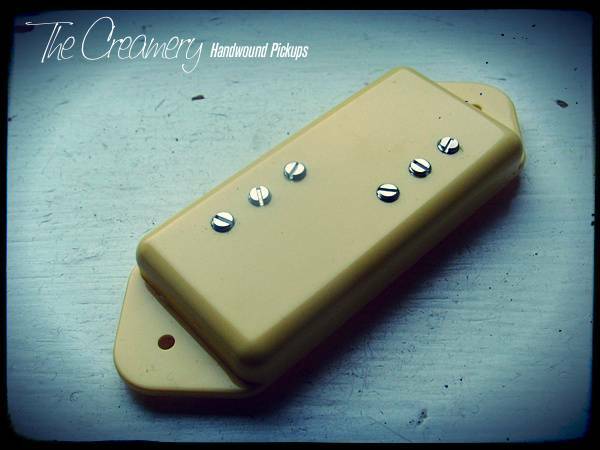 A great versatile replacement Wide Range Humbucker Pickup for your Les Paul Junior. PLEASE NOTE: These pickups are a direct drop-in to fit a standard regular P90 Dogear Size and unlike a number of other similar styled pickups which are essentially a standard humbucker with bar magnet, these are true to the spirit of the old Seth Lover Wide Range / Thinline humbuckers with threaded magnets and ferrous internal reflector plate. You can find more details of my Creamery Custom Shop Handwound Replacement Wide Range Tele, Thinline & Deluxe Humbucker Pickups here.